In higher vertebrates, from amphibians to humans, epidemial maturation is a conserved developmental process. Using adult epidemial tissue and an established keratinocyte cell line, the mouse Nkx-2.3 homeobox gene was demonstrated, for the first time, to be expressed in mouse epidermal keratinocytes. Under the normal culture condition, the spontaneous aggregation phenomenon, a common initiation step of ES cell differentiation, and the induction of mouse adult K1 keratin, a marker of mature epidermal keratinocytes, were both observed in vitro when the Xenopus Nkx-2.3 gene was stably transfected into a mouse pluripotent P19 EC cell line. The induction of mouse K1 keratin by using its Xenopus orthologous gene in the mouse P19 cell implies that Nkx-2.3 may play a conserved role in the epidermal maturation of the mouse, as it does in that of the frog (Ma, 2004). However, the CAT assay study on frog adult keratin promoter could not find the induction of adult keratin. This implies there might not be a direct activation of its promoter. Key terms: Nkx-2.3, epidermis, homeobox gene, skin maturation, differentiation. Late organogenesis of epidermis bears many conserved features between mammals and frogs. After gastrulation, their skin ectoderms double the layers and change the keratin expression patterns to become embryonic epidermis (Fuchs, 1995), (Jamrich et al., 1987). The bi-layered embryonic epidermis of mammals or frogs is composed of an inner basal layer and an outer apical layer (periderm) (Byrne et al., 1994; Holbrook, 1979; Miller, 1996). Cells of both layers constantly proliferate to accommodate the growth of an embryo or a larva, while some cells in the periderm are sloughed off through programmed cell death (Holbrook and Odland, 1975; Schreiber and Brown, 2003). The embryonic epidermis lasts for a significant period of time, from 36 to 55 days EGA (estimated gestational age) in human embryos (Holbrook and Odland, 1975), from E9.5 to El5.5 in the mouse embryos (Byrne et al., 1994; Fuchs, 1995), and through the stages preceding metamorphosis in tadpoles (Byrne et al., 1994; Fuchs, 1995; Furlow et al., 1997; Holbrook and Odland, 1975). During this period of time, the cell fate of the ectoderm gradually changes into the adult epidermis by expressing adult basal keratins, K5 and K14 in mammals (Fuchs, 1995) or RAK and XAK-C in frogs (Fuchs, 1995; Suzuki et al., 2001; Watanabe et al., 2002). However, these basal cells do not initiate the terminal differentiation program, which stacks up the keratinocytes into multilayer in epidermis until E15.5 of a mouse embryo or stage 61 (the climax of metamorphosis) of a tadpole by expressing suprabasal keratins, K1 and 63 kDa keratin respectively (Fuchs, 1995; Nishikawa et al., 1992; Watanabe et al., 2001; Watanabe et al., 2002). This transition from the appearance of adult basal keratin to the appearance of suprabasal kerain in the developing epidermis is defined in this report as epidermal maturation. Currently, the mechanism of epidermal maturation is better known in frogs than in mammals. In frogs, it happens during metamorphosis and is triggered by a surge of a single hormone, T3. As T3 level elevates in blood during metamorphosis, the tadpole basal cells start expressing larval basal keratin, XLK, and later transform into the adult basal cells with a Xenopus homologue of mammalian K14 keratin, XAK-C (Watanabe et al., 2001; Watanabe et al., 2002). After committing to the adult fate, the frog basal cells may then begin the terminal differentiation program as T3 reaches the highest level (Miller, 1996; Watanabe et al., 2001; Watanabe et al., 2002). The discoveries of the induction of suprabasal 63 KDa keratin and the precocious transformation of the basal cells into the adult form both in vitro and in vivo by T3 reveal that a T3-mediated mechanism alone is sufficient to initiates epidermal maturation in Xenopus (Mathisen and Miller, 1989; Miller, 1996; Nishikawa et al., 1992; Shimizu-Nishikawa and Miller, 1992). In addition to the impact of T3 on keratins, a member of the NK-2 homeobox genes, XNkx-2.3, was also found to tightly link with epidermal maturation during metamorphosis by examining the spatial and temporal expression pattern of XNkx-2.3 and its response to T3 induction in vivo and in skin explants (Ma, 2004). Although the maturation trigger of mammalian epidermis is still unknown and the action of thyroid hormones (TH) on epidermis is quite different between mammals and frogs (Holt and Marks, 1977; Isseroff et al., 1989), a similar phenomenon of epidermal maturation observed in tadpoles happens in mice, as stated above. Therefore, the expression of Nkx-2.3 in the mouse should be explored further. Nkx-2.3 gene in the epidermal maturation between mouse and frog, the over-expression of the Xenopus Nkx-2.3 gene to induce the adult K1 keratin in the mouse pluripotent P19 cell line is tested. Finally, to find out the possible relationship between Nkx-2.3 protein and its induced adult keratin, the CAT-reporter system is transiently transfected into various mammalian cell lines. Newborn mice were produced by mating the super-ovulated female NIHSwiss with male C57BL/6. The epidermis was separated from the dermis after overnight (approximately 18 hours) treatment of skin tissues peeled from newborns, using 1.2 U/ mi Dispase II (Roche) at 4°C. The intestine, liver, and heart were also collected for RNA extraction. RNA isolation and "same-tube quantitative RT-PCR"
Total RNA was isolated using the RNaid Plus Kit (Q Biogene). "Same-tube quantitative RT-PCR" was conducted accordingly (Ma, 2004). Briefly, 1-2 μg of total RNA treated with RNase-free DNase from various tissues was subjected to reverse transcription using random primers (Promega), and one-tenth to one-fifteenth of the product was used for PCR. The PCR was carried out in two steps. First, the solution containing Nkx-2.3 primers, cDNA, reaction buffer, and Taq polymerase (Gibco-BRL) was reacted for 8-10 cycles, and then the reaction was stopped at 4°C. In the second step, the internal control (β-actin) primers and IX reaction buffer with Taq DNA polymerase were added into the reaction solution for the remaining 30 cycles of amplification. In the case of GAPDH as the internal control gene, the second step of PCR was performed for 25 cycles. Each PCR cycle consisted of 30 sec at 94°C, 30 sec to 1 min at 55°C, and 1.5 min at 72°C. The relative amount of mouse Nkx-2.3 transcript was determined by calculating the ratio of its band intensity to the band intensity of internal control. 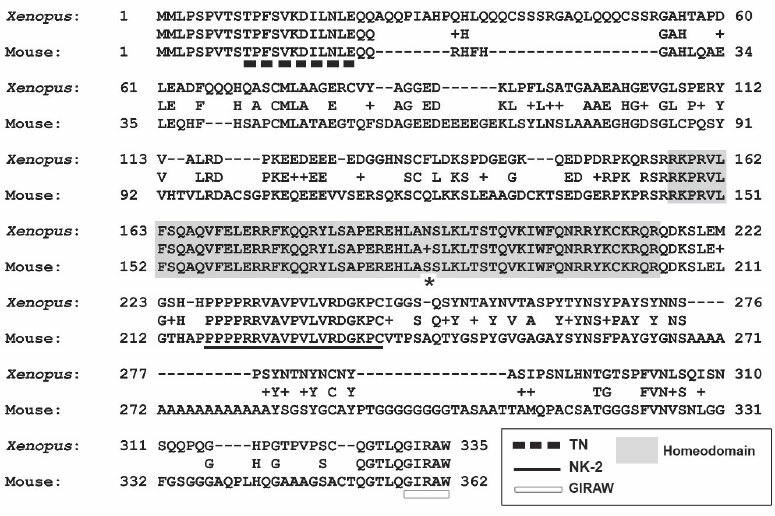 The primer pairs used in RT-PCR were MNK23U (5'-TAAGGCCTGGGCGGGAC ACG-3') and MNK23D (5'-CCATGGCCC CTTGGAAGGAG-3') for the Nkx-23 gene, GAPDHU (5'-GTGTTCCTACCCCCAATG TG-3') and GAPDHD (5'-TGTGAGGGAG ATGCTCAGTG-3') for the GAPDH gene, and MBU (5'-GGTTCCGATGCCCTGAGG CT-3') and MBD (5'-CCAGGATGGAGCC ACCGATC-3') for the (β-actin gene; and the expected product sizes were 144 bp, 407 bp, and 279 bp, respectively. The primer set for the mouse K1 gene was MK1U (5'-AGAGGTGGCTCTGGAGGG-3') and MK1L2 (5'-CCATGTTTGGCCTTGATGG A-3'), which was expected to produce a 216 bp DNA fragment. The primer set of mouse K1 gene was placed together with the (β-actin primers to perform the "same-tube RT-PCR" for 32 cycles. To prepare a mammalian expression construct, the complete Xenopus Nkx2.3 coding region from pCS2+-XNkx2.3 (gift of Sylvia M. Evans) (Evans et al., 1995) was inserted into a CMV-mediated expression vector, pCDNA4/HisMax (Invitrogen), to make pCDNA4-XNkx2.3. pCDNA4/ HixMax contains an N-terminal peptide encoding the Xpress epitope and a polyhistidine tag for detection and purification of the fusion protein. To prepare the promoter-reporter plasmids, a 5.2 kb Hindlll-Hindll DNA fragment from the 5' region of the 63 KDa keratin gene was inserted into pCAT-Basic (Promega) to make pCAT-5200. The shorter 63 KDa keratin promoter constructs, pCAT-2300 and pCAT-630, were constructed by inserting a 2.3 kb Hindll-Hindll fragment into the Hindll linearized pCAT-Basic and by deleting the Hindlll-BamHl fragment from pCAT-5200 respectively (Figure 6A). Other plasmids that were used included pRSVCAT, a positive control for the CAT assay, and pRSVZ, a lacZ containing plasmid for equalizing the variation of transfection efficiency. The P19 embryonic carcinoma cell line was cultured as described (Skerjanc et al., 1998), except DMEM (Gibco-BRL) was used. 10 μg of pCDNA4-XNkx2.3 was used for CaP04 transfection of the XNkx-2.3 gene into P19 cells. Cells were selected in medium containing 400 μg/ml of Zeocin (Invitrogen) for 2 weeks. The drug-resistant clones were picked and maintained in the same medium for another 2-3 weeks to achieve stable growth. The selected clones were routinely cultured in medium containing 200 μg/ml of Zeocin according to the manufacturer's instructions (Invitrogen). The stable lines that expressed high levels of the fusion protein were identified by Western blot analysis using Anti-Xpress antibody (Invitrogen) and further confirmed by immunocytochemical staining. The mammalian cell lines used for transient transfection and CAT assay were HeLa, NIH3T3, HaCaT, and P19. They were maintained in DMEM (Gibco-BRL) with 10% calf serum and incubated at 37°C with 5% C02. The CaP04 method was also used for transient transfection. Generally, cells were transfected with 8 μg pCAT-630, 10 μg pCAT-2300, or 15 μg pCAT-5200 with 3 μg of pRSVZ plasmid, and 0-20 μg of pCS2+-XNkx2.3 or pCS2+ plasmid. A non-related plasmid, pBluscript KS (Stratagene), was used to equalize the total amount of DNA used for transfection. The cells in 90-mm culture dishes at 30-40% confluence were incubated with the proper plasmids for six hours and subjected to a 90 second 5% glycerol shock. The cells were allowed to express the transfected genes for an additional 48 hours of incubation before being harvested. The harvested cells were washed twice with PBS, resuspended in 150 μl of 0.25M Tris-HC1 (pH=7.8), and lysed with four quick freeze-and-thaw cycles. Part (20-40 [fl) of the lysate was used to perform the (3-gal assay reaction by adding in 0.2 mi of 2mg/ mi 2-nitrophenyl-(3-D-galactopyranoside substrate (ONPG from Roche). The variation of transfection efficiency was determined by OD42o reading on the intensity of (3-gal activity of a co-transfected pRSVZ plasmid. The rest of the lysate was heated and prepared for loading on a thin layer chromatography (TLC) piate (Whatman). The loading amount used was adjusted based on the (3-gal OD reading. The CAT reaction mixture was prepared by adding the proper amount of cell lysate, 30 ul of 4 mg/ml acetyl coenzyme A (Sigma), 0.2 uCi of C14-labeled chloramphenicol (Amersham) and the proper amount of 0.25M Tris-HCl (pH=7.8) to a final volume of 150 ul. The mixtures were then incubated at 37°C overnight and extracted with lml of ethylacetate (Fisher). The ethylacetate extract was concentrated to 25 ul and spotted on a TLC plate. The TLC plates were exposed to X-OMAT film (Kodak) for up to two days. Stable transfectants cultured in 90-mm dishes were washed with PBS twice and subjected to purification through His-Bind Quick 300 Cartridges (Novagen). Briefly, 1.0 mi ice-cold lx binding buffer (5 mM imidazole, 0.5 M NaCl, 20 mM Tris-HCl, pH=7.9) with 0.1% NP-40 (Sigma) was added to each dish for lysis; then the lysates were collected and sonicated before applying to the cartridges. After eluting from the cartridges, samples were concentrated by spinning in Microcon-10 Microconcentrators (Amicon). The proteins were separated by 12% SDS-PAGE and transferred to the Immobilon-P membrane (Millipore). The membrane was blocked with 10% casein, incubated for 1 hr with primary antibody, Anti-Xpress (Invitrogen), followed by lhr incubation with alkaline phosphatase conjugated secondary antibody, anti-mouse IgG (Novagen). NBT/ BCIP (Boehringer Mannheim) was used as the substrate for detecting the signal. Approximately 3-5 xlO4 cells were plated on a single-welled Lab-Tek II Chamber Slide (Nalge Nunc International) and cultured overnight. Cells were then washed with 37°C pre-warmed, serum-free medium three times, dehydrated, and fixed with 100% cold methanol for 5 minutes, then air dried. The dried cells were re-hydrated with IX PBS for 10 minutes at room temperature, blocked with 3% BSA for 30 minutes, and then incubated with the primary antibody, Anti-Xpress (Invitrogen) for one hour. After an additional hour of incubation with secondary antibody, alkaline phosphatase conjugated anti-mouse IgG (Novagen), the NBT/BCIP (Roche) was used as the dye substrate. The slides were dehydrated with ethanol, cleared with Hemo-De (Fisher) and mounted with SuperMount (E.K. Industries, Inc). Results were observed under an Olympus Research Microscope, Model AHBS (Olympus OpticalCo.Ltd). To determine if Nkx-2.3 is expressed in the mouse epidermis, the relative amount of mouse Nkx-2.3 transcript in various tissues including epidermis was examined by a "same-tube RT-PCR" method. As shown in Figure 1, the Nkx-2.3 band was detected in the mouse epidermis that was separated from the dermis of the skin by treating with Dispase II (lane 2). The primers for mouse Nkx-2.3 generated a 144 bp fragment, which is located directly after the stop codon in the 3'-UTR. Based on the BLAST searching result, there is no nucleotide homology of this region with the sequences of other genes, including the rest members of the NK-2 family. Therefore, the fragment in the RT-PCR is Nkx-2 J-specific. The intestine and the liver were served as a positive and a negative control respectively, according to the previous findings (Biben et al., 2002). 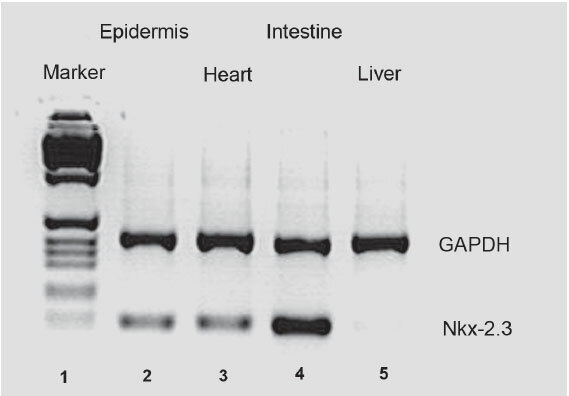 The absence of the Nkx-2.3 band in liver (lane 5), a negative control tissue, and the presence of a good amount of the GAPDH band, an internal control, demonstrated the appropriate RNA preparation and the proper PCR condition used. The use of the "same-tube RT-PCR" method eliminates the quantitative variation derived from the sample preparation in different tubes. Therefore, the result showed the strongest expression of Nkx-2.3 in the intestine (lane 4), and about the same amount of expression in the epidermis and the heart (lanes 2 and 3 respectively) as the loading control (GAPDH) was in similar amounts. Using an Nkx-2.3 gene-specific primer set, the presence of Nkx-2.3 transcript in the mouse epidermis was proven for the first time. In Xenopus skin, the XNkx-2.3 gene has been shown to be expressed in the epidermal keratinocytes (Ma, 2004). It would be also interesting to see if the Nkx-2.3 gene is expressed in the mouse epidermal keratinocytes. A mouse epidermal keratinocyte cell line (gift of Dr. Angela L. Tyner) was examined. It was used because of a concern about the contamination of other cell types in the epidermal tissue or the primary keratinocyte culture. Thus, the RT-PCR signal derived from keratinocytes would be indistinguishable from that of the contaminated cells. In addition, this line has been proven for its capability to respond to high-Ca2+ treatment, which then induces the terminal differentiation markers, such as loricrin, involucrine and transglutaminase (Vasioukhin and Tyner, 1997). Therefore, this keratinocyte cell line is mature and can lead to terminal epidermal differentiation. Figure 2 shows the keratinocyte cultures from both high-Ca2+ (lane 3) and low-Ca2+ concentrations (lanes 4 and 5) expressed Nkx-2.3 gene. This result implies that Nkx-2.3 transcript is indeed in the mouse epidermal keratinocytes. The specificity of the RT-PCR product of Nkx-2.3 gene was tested by cutting with Ava II and yielding the expected 91-bp and 53-bp bands (lane 5). A complete cut of the Nkx-2.3 band by Ava II meant the purity of this band. 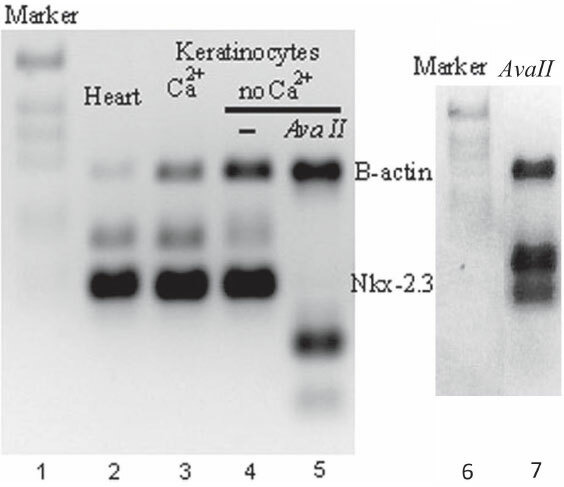 The density ratios of Nkx-2.3 band to (β-actin band in keratinocytes were 2.0 and 1.1 for lanes 3 and 4 respectively. These ratios represented the relative abundance of the Nkx-2.3 transcript. Thus, the relative amount of Nkx-2.3 transcript was about 2-fold higher in cells induced to terminally differentiate with high-Ca2+ treatment (Figure 2, lane 3 labeled as "Ca2+") than in cells without high-Ca2+ treatment (lane 4 labeled as "no Ca2+"). The possible role of Nkx-2.3 in the Ca2+-induced terminal differentiation of keratinocytes needs further investigation. Nonetheless, the expression of the Nkx-2.3 gene in the mouse epidermal keratinocytes was confirmed. Using primers specific for the 3'-UTR of mouse Nkx-2.3, same-tube quantitative RT-PCR showed the expected 144 bp DNA band produced from epidermis, heart, and intestine, but not liver. GAPDH cDNA, the 407 bp band, served as an internal control. The temporal and spatial expression patterns and the T3 regulation of XNkx-2.3 gene make it fit the role in the maturation of the frog epidermis (Ma, 2004). Although TH is not the epidermal maturation trigger in the mouse, the mouse and Xenopus Nkx-2.3 proteins are about 58% identical in their amino acid sequence s, and all of their four functional domains, TN (tinman), homeodomain, NK-2 SD, and GIRAW, are well preserved except for one amino acid in the homeodomain (Figure 3). This implies that the function of Nkx-2.3 in cells may likely be conserved between these two species. To test if the Nkx-2.3 protein has the conserved function between frog and mouse, the Xenopus Nkx-2.3 gene was transfected into a mouse pluripotent embryonic carcinoma (EC) cell line, P19, to determine if over-expressing XNkx-2.3 would channel a pluripotent cell line towards the adult epidermal fate. The result of same-tube quantitative RT-PCR showed the expected 144 bp DNA band produced from RNA of both Ca2+- (lane 3) and non-Ca2+-treated (lane 4) keratinocytes. An internal cut of restriction enzyme (Ava II) was used to confirm the specificity and the purity of Nkx-2.3 cDNA fragment. The expected 91 bp and 53 bp bands were yielded after Ava II cutting (lane 5). A shorter gel running time gave a clear 53 bp band in lane 7. Mouse (β-actin, the 279 bp cDNA fragment, was the internal control. The 1 Kb DNA ladder (Gibco-BRL) was used as a molecular weight marker. The first band on the top of lane 1 is 506 and 517 bp fragments. Introducing the Xenopus gene into the mouse cell line was due to the lack of appropriate Xenopus pluripotent cell line. The mouse P19 cell line was chosen because its clonal sublines are readily obtained at high frequency and the transfected clones retain their ability to differentiate into the cell types derived from all three embryonic germ layers (Bain et al., 1994; McBurney and Rogers, 1982; Rossant and McBurney, 1982). Several Zeocin-resistant cell clones were selected. Taking advantage of the His tag in pCDNA4/HisMax mammalian expression system, the cell extract of the clone was partially purified through a Ni-column. Using Western blot of the Ni-purified protein with antibody against Xpress (an epitope tag in the pCDNA4/HisMax), 2 stable transfectants clones 6 and 7, were identified to express XNkx-2.3-Xpress fusion protein of the expected size (the twofine bands indicated by an arrow in Figure 4A, only clones 1 to 7 shown). The expression of the XNkx-2 J-Xpress fusion protein in clones 6 and 7 was further confirmed by immunocytochemical staining of all Zeocin-selected clones with antibody against Xpress (Figure 4B, only clones 2, 3, 6, and 7 shown). During routine culturing, clone 6 and clone 7 tended to aggregate spontaneously (indicated by arrowheads in Figures 4B and 5A), which is a differentiation phenomenon of embryonic carcinoma cell (Martin and Evans, 1975). Figure 3: Sequence comparison of the Nkx-2.3 proteins between mouse and Xenopus. Four functional domains, TN, homeodomain, NK-2, and GIRAW, are labeled as indicated in the box. "+" represents a high similarity of the amino acid in the position. The only amino acid difference (asterisk) among all four functional domains is in homeodomain. The sequence comparison was performed on "NCBI-Blast 2 Sequences" using BLOSUM62 matrix. In order to investigate any epidermal differentiation occurring among XNkx-2.3 transfectants, the "same-tube RT-PCR" was used to examine the expression of K8, K5, and K1 keratins. Keratins are excellent markers for epidemial development. As mentioned previously, the epidemial ontogenesis has been well defined in the mouse by examining the expression pattern of keratin markers. Among the four cell clones tested, clones 5-8, the K8 or K5 transcripts could not be detected by RT-PCR using several sets of primers (data not shown). 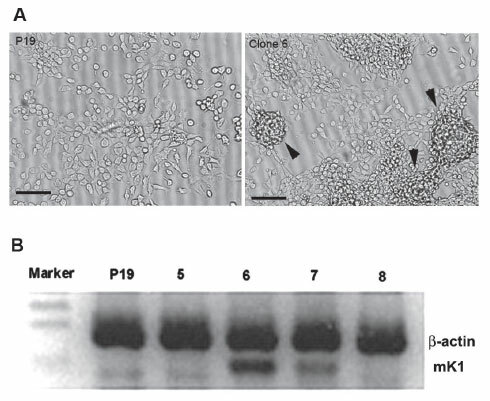 However, the adult keratin, K1 (the lower bands in Figure 5), was found in clone 6 and clone 7, which were the two clones expressing XNkx-2.3-Xpress fusion protein, but not in clone 5, clone 8, or non-transfected P19 cells (Figure 5B). This result suggests that the adult K1 keratin could be induced by the over-expression of Nkx-2.3 gene in P19 pluripotent cells. Figure 4: Stable XNkx-2.3-P19 clones expressed the XNkx-2 J-Xpress fusion protein. (A) 2 out of the 7 drug-resistant clones, 6 and 7, were positive for expression of X/Vfcx-2.3-Xpress fusion protein detected by the Western blot using Anti-Xpress antibody. The molecular size of the fusion protein was about 40 KDa, as indicated by arrow. A non-specific unknown band existing in every pardal purified sample was used as the loading control. activity without a promoter and the RSV-CAT is a positive control with RSV promoter. 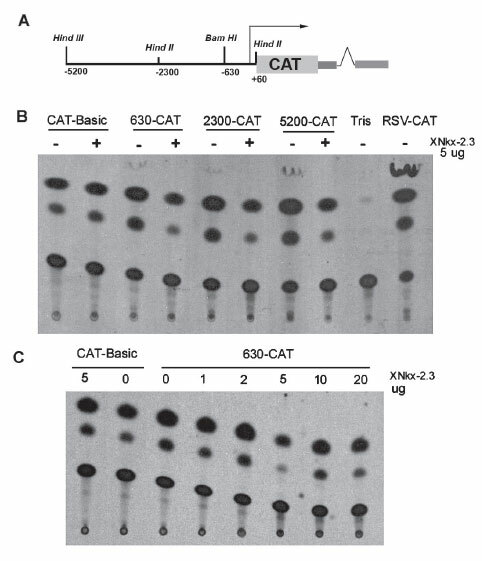 In fact, the input of 20 μg of XNkx-2.3 expression plasmid had no activation effect on all three promoter-reporter constructs (Figure 6, C showed the pCAT-630 result only). Although the slightly weaker CAT signals were observed when adding 5 μg of expression plasmid, this weak inhibition was only found in P19 cells but not in other host cell lines used (data not shown) or other DNA amounts (10 ug or 20 μg) used (Figure 6C). Another noticeable difference in P19 cells transfection was that the CAT-Basic construct gave high background on the basic CAT activity, which was not seen in other cell lines. Overall, the results of the CAT assay indicated that Nkx-2.3 gene could not directly activate the 63 KDa keratin promoter in several mammalian host cells that were tested. Figure 5: Spontaneous aggregation and K1 induction in the XNkx-2 J-P19 stable clones. (B) Mouse K1 keratin (mK1), a 216-bp fragment, was found to be expressed in clones 6 and 7 detected by the "same-tube RT-PCR". Clones 5 and 8 identified as weaker expression clones by Anti-Xpress staining did not have K1 induction. The β-actin was used as an internal control. The present study demonstrated for the first time that the expression of Nkx-2.3 gene is in the mouse epidermis and the mature keratinocytes. The Nkx-2.3 proteins of mouse and Xenopus are almost identical for all four functional domains. In this study, the cross-species induction of the adult K1 keratin in a mouse pluripotent cell line by the Xenopus Nkx-2.3 gene implies that this gene may has a conserved role in epidermal maturation for both species. However, the mechanism of the induction is still unknown. Figure 6: CAT assay for co-transfection of the XNkx-2.3 gene and the 63 KDa keratin promoter. (A) The 5.2 kb 5' region of the 63 KDa keratin gene was digested with different restriction enzymes to produce the 2.3 kb and 630 bp fragments for constructing the CAT reporter system (Materials and Methods). (B) The 63 KDa keratin promoter constructs (5200-CAT, 2300-CAT, 630-CAT) were transfected into P19 cells with (+) or without (-) the XNkx-2.3 gene. The number before the CAT presented for the length (in base pair) of the promoter. The Tris buffer, CAT-basic, and RSV-CAT were used as the background, negative and positive controls respectively. (C) Various amounts of the pCS2+-XNkx2.3 plasmid were tested using 630-CAT reporter construct. The cell extract for CAT reaction were adjusted by OD42o readings of the total proteins and the (3-gal activity from the expression of a co-transfected lacZ plasmid, pRSVZ. The pCS2+ and the pBluescripts-KS vectors were added to even the quantity difference of pCS2+-XNkx2.3 and pCAT-promoters used in P19 cells respectively. As shown in Figures 1 and 2, mouse Nkx-2.3 was indeed expressed in both the adult mouse epidermis and the mature epidemial keratinocyte cell line, which are adult differentiation program ready. According to the expression patterns of Xenopus Nkx-2.3 in the developing epidermis of tadpoles, this gene is considered as an important marker for epidermal maturation (Ma, 2004). In addition, as described in the introduction, several features of skin maturation are well conserved between the frog and the mouse. Together, the presence of a good amount of Nkx-2.3 transcript in mature mouse epidermal keratinocytes implies that the Nkx-2.3 gene may play a conserved role in skin maturation of the two organisms.In Xenopus, the heart also expresses XNkx-2.3 gene (Evans et al., 1995; Ma, 2004). The results in this study show that the mouse heart has a significant amount of Nkx-2.3 transcript (Figure 1, lane 3; Figure 2, lane 2), which is in contrast to a previous study using RNase protection assay (Biben et al., 2002). The reason for this difference is not clear. However, the specificity of the PCR product in this study was carefully examined by sequencing and by checking an internal Ava II cut (lane 5 in Figure 2). In addition, the use of DNase-treated RNA excluded the possibility of genomic DNA contamination in the RT-PCR template. The absence of DNA contamination in the RNA sample of this study was also evidenced by the absence of a 500 bp intron-containing DNA fragment that would be amplified by the (β-actin primers in the RT-PCR result (Figure 2). Henee, the detection of Nkx-2.3 product in the heart sample is unlikely the noise signal from PCR amplification or a result from genomic DNA contamination. Turksen were able to produce almost 100% of K14-positive early EPC (epidermal progenitor cells). From the EPC, they can simúlate the sequential differentiation events of the epidermal cell fate, which is similar with those oceurring during the normal mouse development, although they only generated the K1-expressing cells in a low efficieney manner when using the medium in which the Ca2+ concentration (1.8 mM) is high enough to induce the terminal differentiation (Troy and Turksen, 2005; Turksen and Troy, 1998). Taken together, aggregation is an important step for epidermal differentiation. Although the relationship between the E-cadherin and the differentiation needs to be further studied, the aggregation phenomenon was observed and related to the over-expression of Xenopus Nkx-2.3 protein in the mouse pluripotent P19 EC cell line. 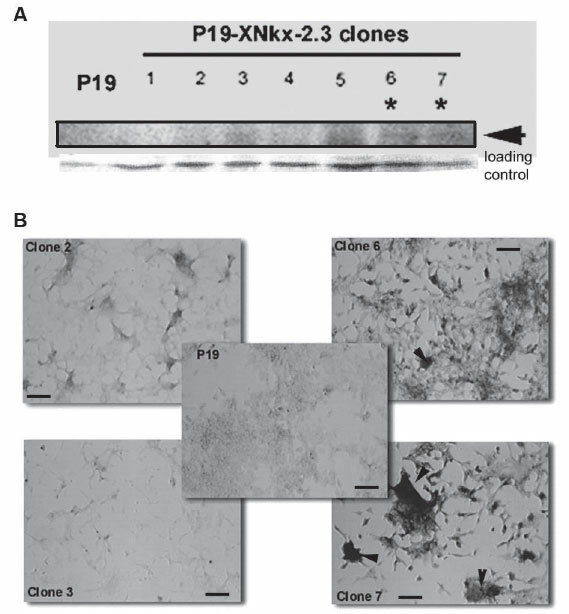 The possibility of conserved role of Nkx-2.3 gene in epidermal maturation was further shown by the K1 keratin induction in the mouse P19 cells transfected with the Xenopus Nkx-2.3 gene. In previous epidermal differentiation study on ES cells, K1-expressing cells only appeared in the culture regions of very high cell density (Troy and Turksen, 2005), where ES cells may differentiate into all types of tissues randomly. The K14-positive EPC derived from ES cells is less mature than the K14-expressing basal cells isolated from newborn skin (Troy and Turksen, 2005). The newborn basal cells easily undergo terminal differentiation when the Ca2+ concentration is elevated to 1.2 mM (Hennings et al., 1980), while for EPC it is more difficult. One of the possibilities is due to the lack of maturation. This observation is consistent with the developmental process of mouse epidermis, in which the K14-expressing basal cells appear at E9.5, but do not terminally differentiate until the maturation program is ready by E15.5 (Byrne et al., 1994). Although the percentage of K1-expressing cells in the stable transfectants was not determined, it showed that K1 transcript was detectable in a significant amount when the XNkx-2.3 was over-expressed in a pluripotent embryonic P19 cell line without increasing the cell density, raising the calcium concentration, or performing suspension method in the culture. In addition, the two K1-positive XNkx-2.3-PÍ9 transfectants, clones 6 and 7, did not show cornification or up-regulation of terminal differentiation markers, such as involucrin and transglutaminase (data not shown) in this study. This means that the stable clones were not in the status of terminal differentiation, even though the K1 was present. Thus, the induction of K1 gene by over-expressing XNkx-2.3 may not be a result of the terminal differentiation that happens only after maturation. Unexpectedly, the CAT assay using the transient transfection on the Xenopus equivalent of mammalian K1 in P19 cells did not reflect that this K1-induction was a direct activation. These repugnant results from stable and transient transfection experiments may result from the sequence difference of the promoters between mouse K1 and Xenopus 63 KDa keratins. However, this possibility can be excluded, because the regulatory mechanisms of the promoters between 63 KDa keratin gene and K1 keratin gene are known to be well conserved on both the basic transcriptional factors and several cis-elements (Warshawsky and Miller, 1995). Another possibility could be that the factors required to activate the keratin gene are simply not pre-equipped in the cells. The factors that act in concert with Nkx-2.3 protein to induce mouse K1 in the stable XNkx-2.3-P19 clones may gradually appear from a process initiated by the stably expressed XNkx-2.3 protein. The pluripotent cells, therefore, may become different from the XNkx-2.3 stable clones and the transient transfected cells. From the observation of spontaneous aggregation occurring only in the XNkx-2 J-P19 stably transfected clones, it was likely that the transfected cells began their differentiation process in a normal culture condition, even though the pluripotent cells were still growing. The interaction between cells in the aggregates and the presence of the over-expressed Nkx-2.3 protein in the transfected cells may lead some cells into the mature epidermal fate. However, this hypothesis needs to be confirmed by further elaborating the detailed expression patterns of several ventral ectoderm factors and epidermal linage markers in the aggregates. Although expression of Nkx-2.3 transcript in adult keratinocytes and induction of adult keratin by Nkx-2.3 gene in pluripotent cells were observed in this study, a role of Nkx-2.3 gene during the skin maturation process remains to be uncovered. Nkx-2.3 is a member of NK-2 homeodomain protein family which may be regulated by BMPs (BMP-2 and 4 especially) and Wnt signals (Harvey, 1996). They were all critical for epidermal fate (Botchkarev and Sharov, 2004; Saitoh et al., 1998). It would be interesting to see if these signals change during skin maturation and cause a change of Nkx-2.3 expression level. However, more complexity of these signal interactions with Nkx-2.3 gene should be noted because down-regulation of the BMP-2 and BMP-4 caused by disruption of Nkx-2.3 gene was observed and suggested in the mouse intestine (Pabst et al., 1999). I am grateful to Dr. Angela L. Tyner at University of Illinois at Chicago (UIC) for providing the mouse keratinocyte cell line and Dr. Sylvia M. Evans at University of Califonia - San Diego for XNkx-2.3 cDNA. This work was mainly performed in Dr. Leo Miller's Lab in the Department of Biological Sciences at UIC and supported by the UIC Campus Research Grant.